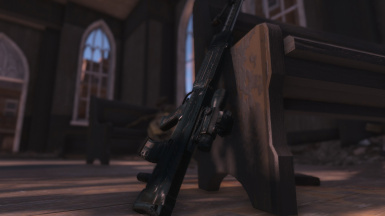 Classic Light Support Weapon from Fallout 2 comes into the Commonwealth. This the first mod that adds custom animation for Power Armor. Light Support Weapon by Scail - TRAD FR Vous devez impérativement installer le mod original en premier. Lisez la page d'accueil de ma traduction pour plus d'informations. 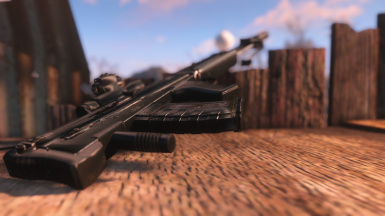 - Added a new weapon using 5,56 caliber ammo. - Updated model muzzle brake special forces for light support weapon. - Completely replaced the textures. - Wrong position of some parts of weapons. - Fixed extra sound when shooting a semi-auto receiver. 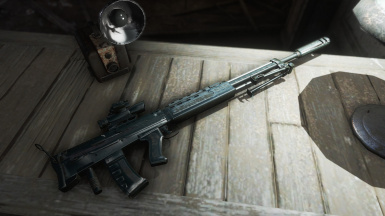 Classic Light Support Weapon from Fallout 2 comes into the Commonwealth. This the first mod that adds custom animation for Power Armor. The mod contains two files. 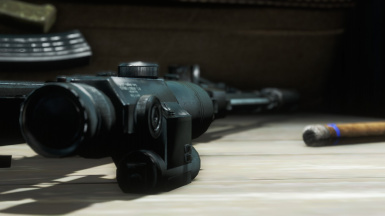 One master-file which adds a new kind of ammunition, the other exactly mod adds LSW. Before you install version 1.1, be sure to remove the files the previous version. - 12 Barrels. 6 normal and 6 Special Forces. - 8 Stocks. 4 normal and 4 Special Forces. - 8 Magazines. 6 normal and 2 Special Forces. - 5 Muzzles. 3 normal and 2 Special Forces. - 17 Receivers. 15 normal and 2 Special Forces. 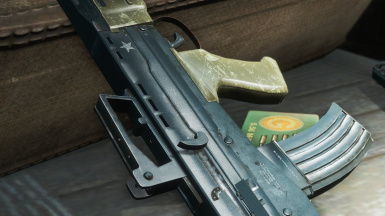 - 6 Reflex Sights. 3 normal and 3 Special Forces. - 9 Optical Scopes. 3 normal and 6 Special Forces. 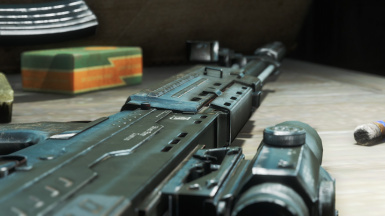 - 2 Iron Sights. 2 normal. - 3 Paints. 2 normal and 1 Special Forces. Total: 70 modifications. 44 normal and 26 Special Forces. 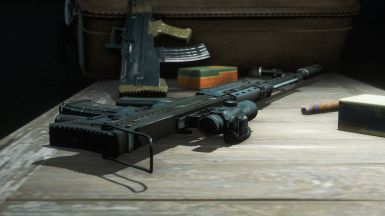 To get a Special Forces modifications, you need to complete the Railroad quest Jackpot. - Ammo can may be found in all territory of the Commonwealth or to buy from vendors. - Ammo added to LevelLists with using script. - Light Support Weapon with modifications. Total: 70 modifications. - Army Support Weapon with modifications. Total: 42 modifications. - LSW can may be found in all territory of the Commonwealth or to buy from vendors. - ASW can may be found in all territory of the Commonwealth or to buy from vendors. - Contains a full set of animations, including animations for Power Armor. - LSW added to LevelLists with using script. - ASW added to LevelLists with using script. In archive together with the main mod. 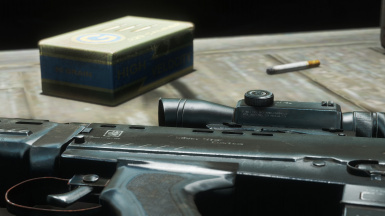 What about compatibility with Horizon and ballistics changing mods? I don't have any plans, but I don't mind if they're made by outside authors. Because it's the original caliber for this weapon. 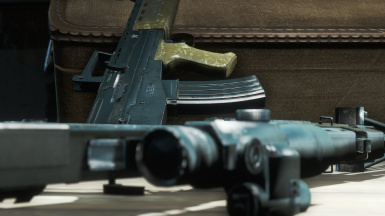 Why was it to make .223 caliber rounds, when the game already has 5.56 rounds? Because this seemingly identical rounds have different ballistic characteristics, the pressure of the powder gases, weight and muzzle velocity and slightly different sizes. They used by different types of weapons with different receivers. Why does the master file? Because in the future I plan to make other weapons under this caliber. Why, along with the mod? Because so far there is no need to release it separately. 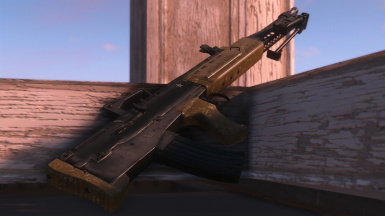 Will there be a patch changing the ammo type to vanilla? When will the rig to animate Power Armor? No sooner than I finish my roadmap.